Mike Huckabee in Jerusalem in 2008. A humble proposal for a small amendment to Godwin’s law, the famous Internet-age adage that holds that all political debates will include an invocation of Nazism if they go on for long enough: If a political debate starts with invocations of Munich, you’ve only gone too far when you specifically bring up gas chambers. Let’s call this Huckabee’s corollary. Former Arkansas Gov. Mike Huckabee says that the response from Jews has been “overwhelmingly positive” to his claim last week that President Obama is marching Israelis “to the door of the oven” with the recently negotiated Iranian nuclear agreement. But that’s a tough claim to make when, as Reuters reports, Israel’s own ruling Likud party is criticizing the comment. But to be fair to Huckabee, it’s not hard to see why he felt the comparison was within the bounds of acceptable discourse, given previous statements by Israeli leaders. After the Obama administration presented a “framework agreement” for a land swap deal with the Palestinians in 2014, deputy foreign minister Zeev Elkin rejected Israel’s 1967 borders as “Auschwitz borders.” Netanyahu compared Iran to the Nazis in a speech at Israel’s Holocaust memorial Yad Vashem in April, asking whether the world had learned nothing from the “incomprehensible universal and Jewish tragedy” of the last century. Huckabee’s blunt reference to the machinery of mass murder was more crass, but it seems like his main mistake was making explicit what was implicit in all the many invocations of Nazism and World War II that have come up in this debate. It also feels a bit strange for an American, devoutly Christian governor to so explicitly invoke the history of Jewish suffering, but after decades of engagement with Israel on a much deeper and more enthusiastic level than nearly any American politician, Huckabee may feel he has mishpocha privileges. Huckabee has visited Israel dozens of times over 40 years, including as leader of a tour/pilgrimage known as the “Israel Experience With Mike Huckabee,” on which the governor, his wife, and evangelical celebrities like the singer Pat Boone usher guests who pay more than $5,000 for the privilege around Israel. The trip’s main focus may be biblical sites, but in the past has included meetings with Netanyahu and Defense Minister Moshe Yaalon. Huckabee told the New Yorker in 2012, “I have a lot of Jewish friends, and they’re kind of, like, ‘You evangelicals love Israel more than we do.’ I’m, like, ‘Do you not get it? If there weren’t a Jewish faith, there wouldn’t be a Christian faith!” For Huckabee, this solidarity expresses itself in uncritical support for the most hawkish and least compromising strain of Israeli foreign policy, whether on negotiations with the Palestinians, settlement construction, or the Iran deal. 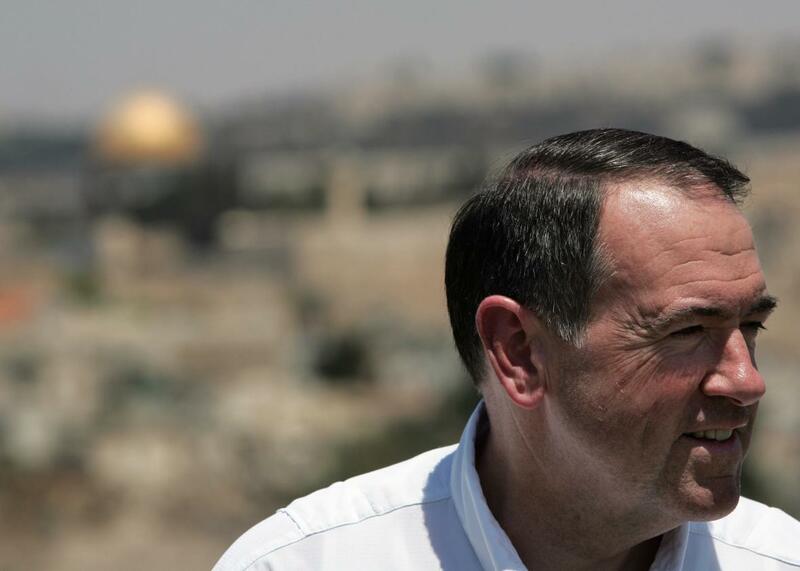 Along with pastor John Hagee, founder of Christians United for Israel, Huckabee is one of the most prominent proponents of Christian Zionism, an increasingly important pillar of Israel’s support in the United States. White evangelical Americans are more likely than American Jews to believe God gave Israel to the Jewish people. Netanyahu has courted the support of evangelicals since the 1990s and has lauded Hagee’s CUFI for helping to bring about a “transformation in the relationship between Christians and Jews.” This relationship has only become more critical as Netanyahu has moved into a more openly partisan partnership with the GOP under the Obama administration. Israeli opponents of the Iran deal may still feel Huckabee has no business invoking gas chambers, but it’s not hard to see why he felt comfortable doing so.